Synopsis (from Indiebound): Albie has never been the smartest kid in his class. He has never been the tallest. Or the best at gym. Or the greatest artist. Or the most musical. In fact, Albie has a long list of the things he's not very good at. But then Albie gets a new babysitter, Calista, who helps him figure out all of the things he is good at and how he can take pride in himself. 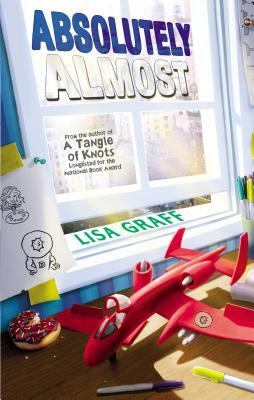 Why I recommend it: Kudos to Lisa Graff for being brave enough to create a character who is ordinary. This is a quiet, thought-provoking novel (if you're looking for fast-paced action, you'll need to look elsewhere). But if you like the idea of reading about an "almost" kid, who's not the best at anything (in other words, maybe you or someone you know), this book will warm your heart. Because even though Albie isn't good at anything like math or reading or art, he's kind and compassionate. And that's good enough, right? I've lived in New York City and the city setting is perfect for this book. I also loved Albie's math club teacher, Mr. Clifton, who starts each class with a really bad math joke. Bonus: Short chapters and smooth writing make this a winner for reluctant readers. My favorite quote: "Then won't you be glad you found something you love?" Congratulations, Faith! Expect an email from me asking for your mailing address. Guest Post and Giveaway, from the authors of A Dragon's Guide to the Care and Feeding of Humans! 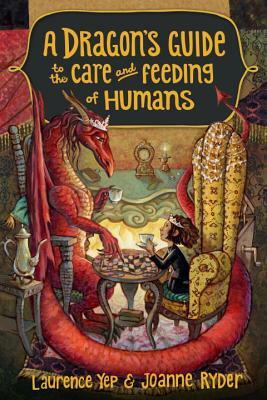 Readers, last week I promised you an exclusive guest post from the authors of A Dragon's Guide to the Care and Feeding of Humans by Laurence Yep and Joanne Ryder (see my review here). Now, I'm thrilled to present their post. Giveaway details below. We were happy to agree to Joanne’s request to do a guest blog post about writing A Dragon’s Guide to the Care and Feeding of Humans. Since Larry and I met in journalism school at Marquette University, we decided to answer some traditional reporter-type questions for you. Who are we? Larry and I are married and children’s book writers. We’ve written well over 100 books, but until recently we wrote books separately. Larry usually writes novels, and I write poetry and picture books. What has changed? We fell in love with the idea of a dragon who has a pet human. We both were so charmed by our 3000-year old dragon, Miss Drake, and her 10-year old pet, feisty Winnie, we wanted to work on the book together. It is our first collaborative work. When do you write? Larry is a lark and writes in the morning. I am an owl and write best in the quiet of night. We talk about our work at lunch…often away from home with a picnic at the beach or enjoying a meal in town. It’s nice to take a break from writing, share problems we’re having, and get new ideas. We always end up writing notes on napkins and stuffing bits of scribbled paper tablecloths in our pockets. Where does the story take place and where do you write? We set the book in San Francisco because we both love the city. Larry was born there, we lived there for years, and we both think of it as a unique and rather magical place. When we moved away and looked for a home in Pacific Grove, we had two conditions. We needed two studies and lots of wall space for bookcases. We each have our own writing spots, computers, and our books nearby. How do two people write one book? I am sure there are many different ways to write together, but this seems to be ours. Larry writes the opening, we work on the overall plot, he writes some chapters, and I write others. We share what we’ve done and rewrite and edit all the parts till we are happy. Larry, as a novelist, has a much better understanding of plotting and dramatic arcs, etc. As a poet, I work on images and details and the emotional thrust of the book. So we each bring the elements we know best to the story. Larry and I have lived together for 30 years. That most likely made this project easier to do. Earlier on we might have had some clashing of egos. But we do respect each other and treat each other kindly most of the time. I think we both kept our relationship in mind as we tussled a bit over plot points. In addition, we do laugh and tease a lot. The banter between Miss Drake and Winnie came quite naturally to us. We both hope readers can see how much fun we had creating these two ever-so-different friends and that they will join us in seeing what Miss Drake and Winnie do in the future. There’s more magic to come! Thank you so much, Joanne and Larry! I loved hearing about your process and especially how a novelist and a poet who are happily married can create magic together. I look forward to more adventures. Readers, the authors have generously offered one signed hardcover copy for a giveaway. To enter, you must be a follower of this blog and you must leave a comment on this post. If you spread the word via Twitter or Facebook, please let me know and I'll give you extra chances for each mention. This giveaway is open to US and Canadian addresses only and will end at 10 pm EDT on Sunday March 22, 2015. Winner will be announced on Monday March 23. Good luck! Synopsis (from the publisher): Crusty dragon Miss Drake has a new pet human, precocious Winnie. Oddly enough, Winnie seems to think Miss Drake is her pet--a ridiculous notion! Unknown to most of its inhabitants, the City by the Bay is home to many mysterious and fantastic creatures, hidden beneath the parks, among the clouds, and even in plain sight. And Winnie wants to draw every new creature she encounters: the good, the bad, and the ugly. But Winnie's sketchbook is not what it seems. Somehow, her sketchlings have been set loose on the city streets! It will take Winnie and Miss Drake's combined efforts to put an end to the mayhem... before it's too late. Why I recommend it: First, full disclosure. Once upon a time, in the late 1970s, I worked as an assistant to a young editor named Joanne Ryder in a major NYC publishing house. (I was "the other Joanne".) Fast forward a few years. I moved back to Pennsylvania, worked in a library, got married and became a mom. Joanne Ryder moved to California and married Newbery-honor-winning author Laurence Yep. Of course, Jo is also an award-wining author, with more than 70 books to her credit. We haven't seen each other in ages, but I still correspond with her and we're Facebook friends. I miss seeing her in person (someday, Jo, someday), but reading her books is the next best thing. When I read in PW that Joanne and Larry were writing a book together for the first time, I begged for an arc. They did better than that. They sent me a signed, personalized hardcover. Woo hoo! Of course, I worried. What if I didn't like it? How would I tell my old friend? Well, you can put your mind at ease, readers, because this book is adorable. It has everything you want in a modern-day fantasy for younger readers: humor, magic, and lots and lots of heart. Plus, not one but TWO spunky heroines. Miss Drake and Winnie made a formidable team. I love a dragon that drinks tea, uses a cell phone, and reads fashion magazines so she'll dress smartly when she changes to human form. And I love that Winnie isn't afraid of Miss Drake or any of the other fantastical creatures they confront. Bonus: This book is the first in a planned series. Favorite quote: A day at the fair could leave a dragon feeling two centuries younger. Readers, be sure to come back next week for Part II -- an exclusive guest post from Laurence Yep and Joanne Ryder, plus a giveaway!